We love getting close up with nature in our family. Our kids (like most children!) are happiest in the outdoors. Little M knows more about plants than I do! 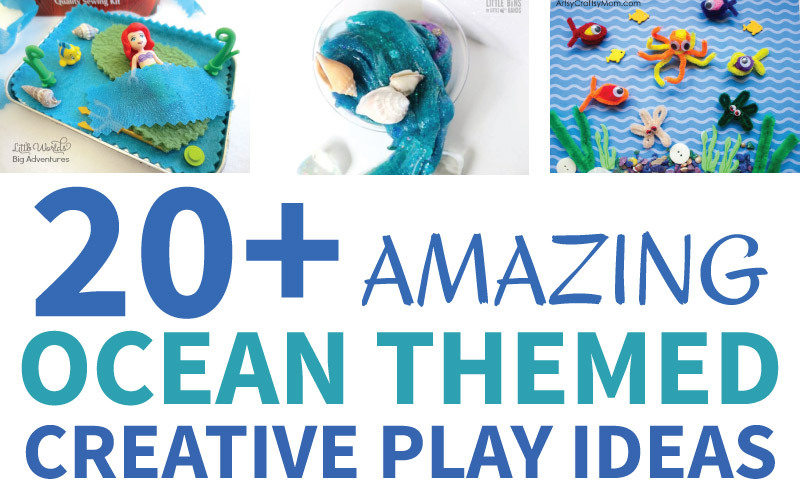 We also LOVE to get creative and do crafty things. 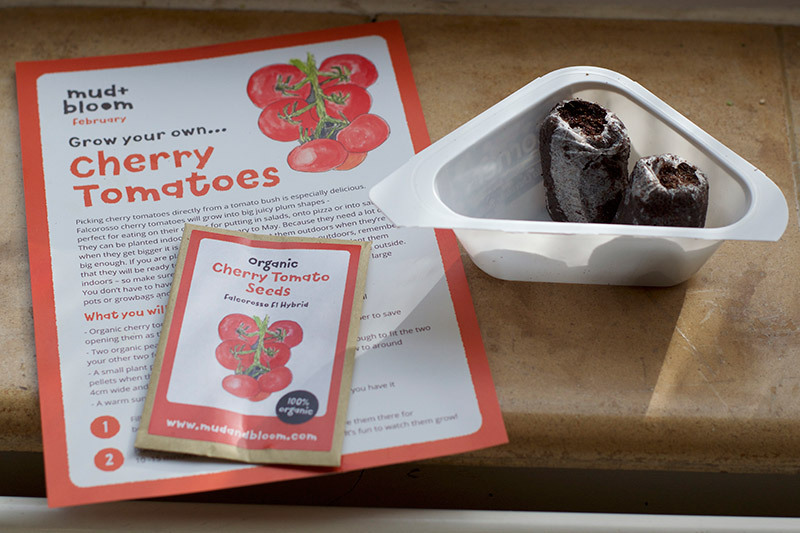 So we were thrilled when Mud & Bloom got in touch and asked us if we would like to try out their gardening and nature craft monthly subscription boxes. Mud & Bloom subscription boxes are monthly boxes that have everything you need to encourage your children to connect with nature. 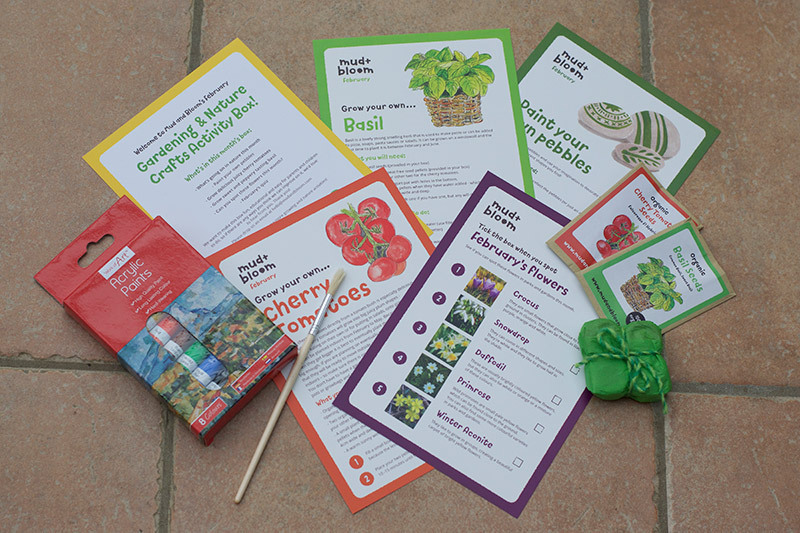 Each box contains a gardening activity and a nature craft – plus instructions, quizzes and games aimed at teaching children all about nature and gardening. 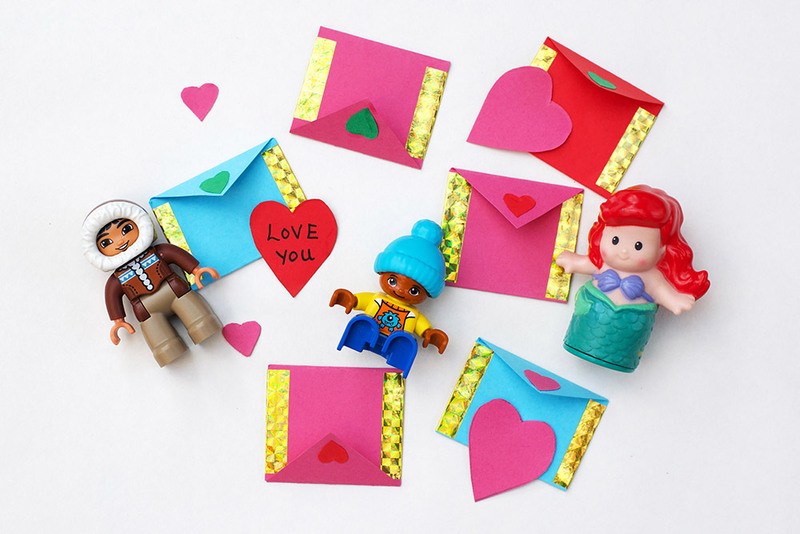 We were very excited to open February’s box! 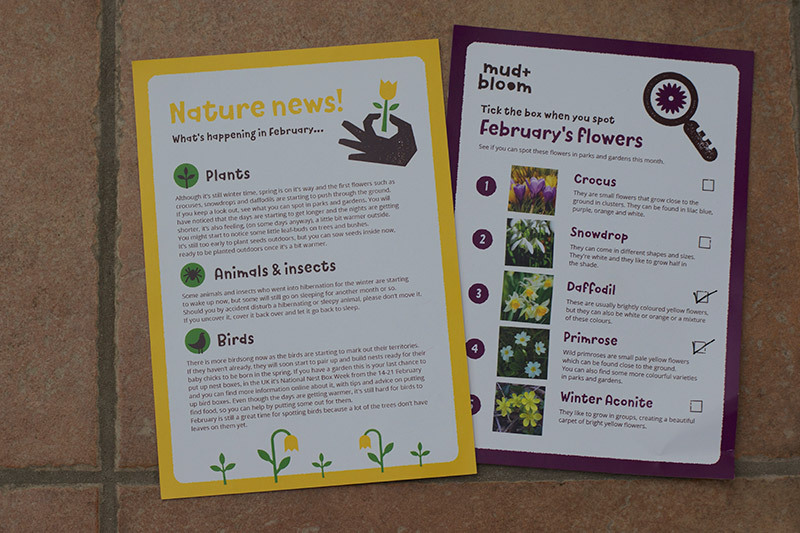 The box had two planting activities, a pebble painting kit and facts and quizzes about wildlife in February. 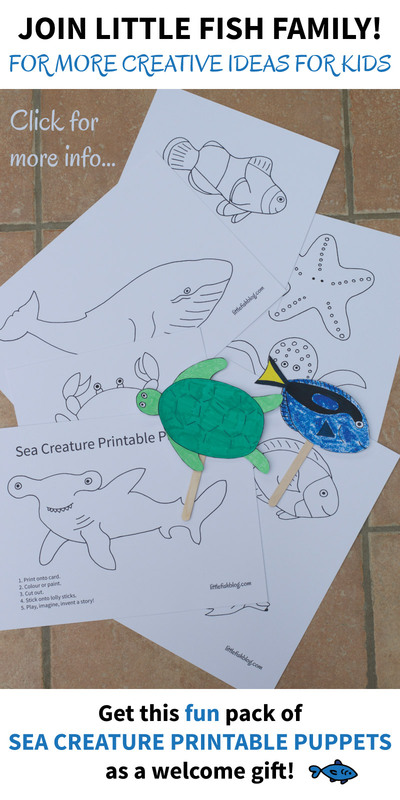 I love that all of the activities come with a simple, clear to follow instruction card – these are fun and brightly coloured too. 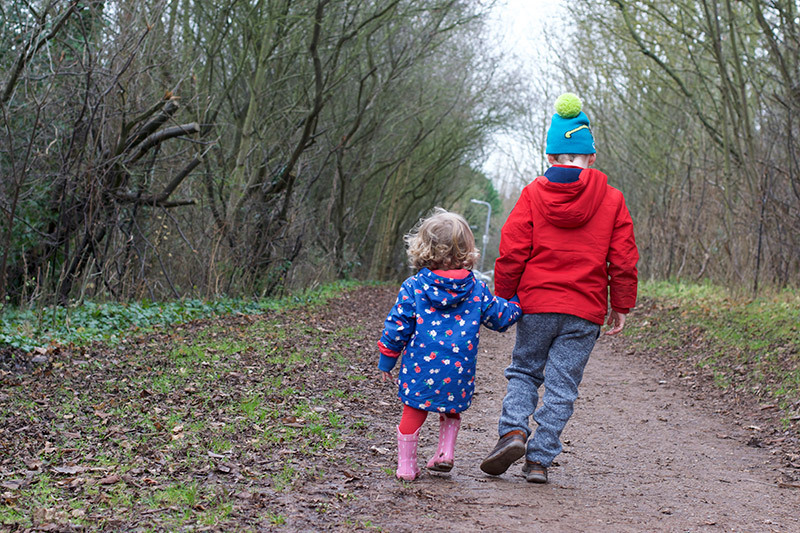 First of all we read some facts about wildlife in February – this was so helpful as a parent and has made me more observant with the children when we have been out and about. Then we got stuck into the activities! First up, was planting tomatoes and basil! Now although I love the outdoors, I’m afraid I’m not very green fingered! Growing plants scares me a little, as I always think it is going to be very complicated! It’s such an important thing for children to see where food comes from though. I’ve been wanting to start some little gardening projects with the kids for a while, but always put it off as until recently we didn’t have a garden. 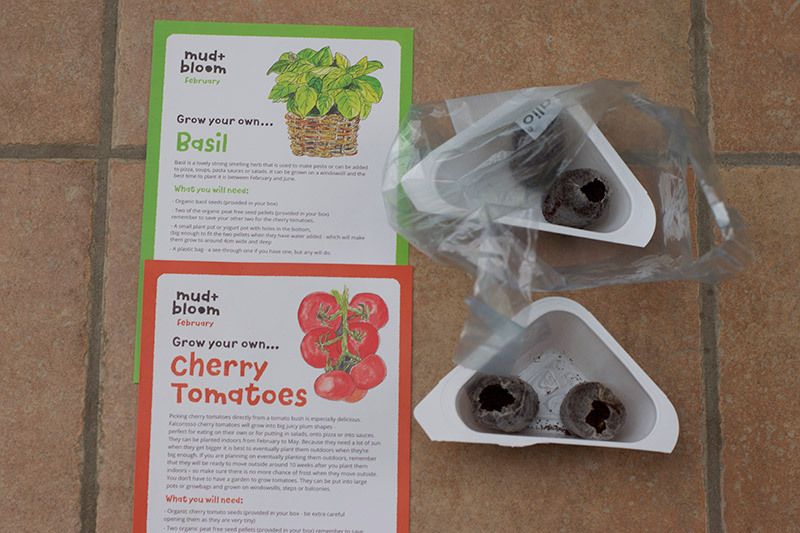 The Mud & Bloom box made it simple and easy to start doing some little planting projects together. It gave me a little push to get started! In the box we received everything we needed to plant some basil and tomato seeds. 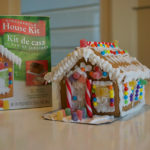 The instructions were so simple and went through it all step by step. I was also able to tell the children some facts about tomatoes and basil and felt like a real expert! This was such a help, I wouldn’t have had a clue otherwise! First of all we had to place some little compost pellets into some warm water to let them expand. The kids were mesmerised! They sat and watched the pellets for a good few minutes! Then we planted the seeds in the compost and put them in a sunny window sill. All we needed was a couple of empty yoghurt pots (which I think most people have!) You can also use empty egg boxes. 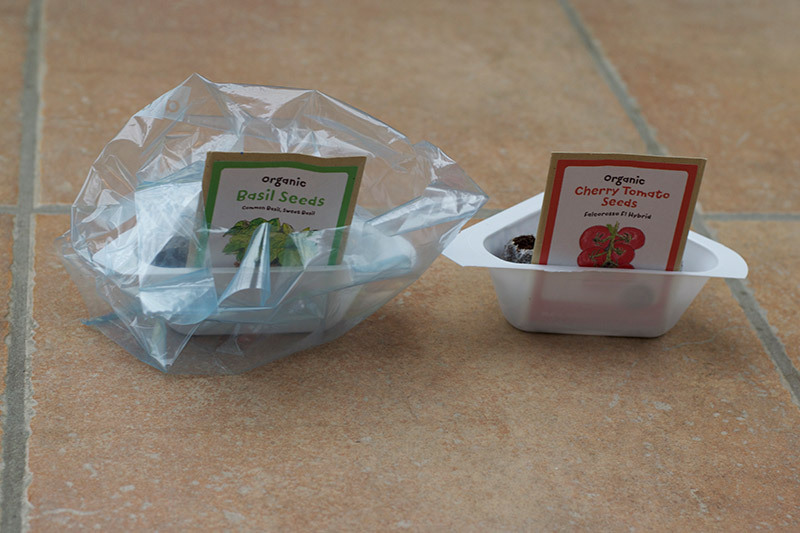 The kit contained everything we needed to plant the tomato and the basil seeds. Next up, we went out and about to spot some February flowers. 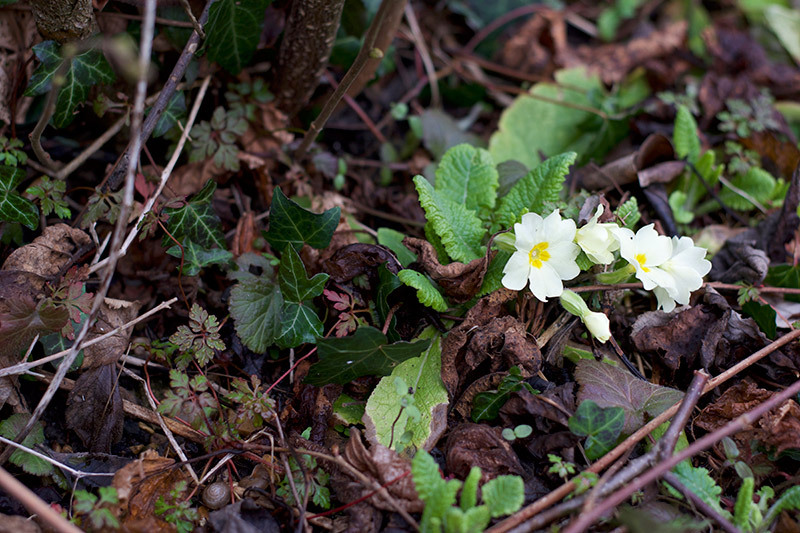 We managed to spot some wild primrose just out in our garden and saw some daffodils starting to poke through too. Again, the fact card was so simple and easy to follow – and I love that it had an interactive checklist. We all learned about which flowers we might see and are now on the prowl to find some more… I think we’ll need to go on a trip to find some snow drops! We also had a little go at the February quiz – we learned that some animals are still hibernating, but that lots of wildlife is starting to appear ready for spring. Our final activity was pebble painting. I was especially excited about this one as a ‘Rock Hunting’ group has just started in our area. 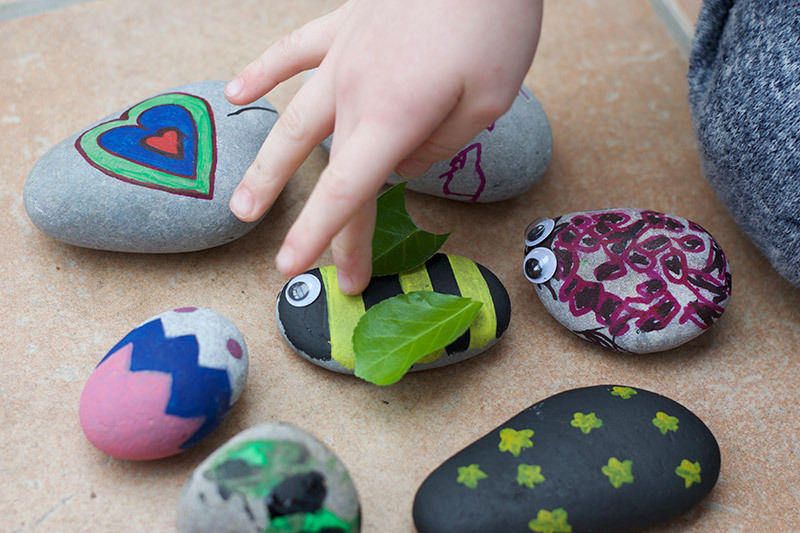 Both the kids love being creative – we were excited to collect and paint our own pebbles and rocks ready for hiding! 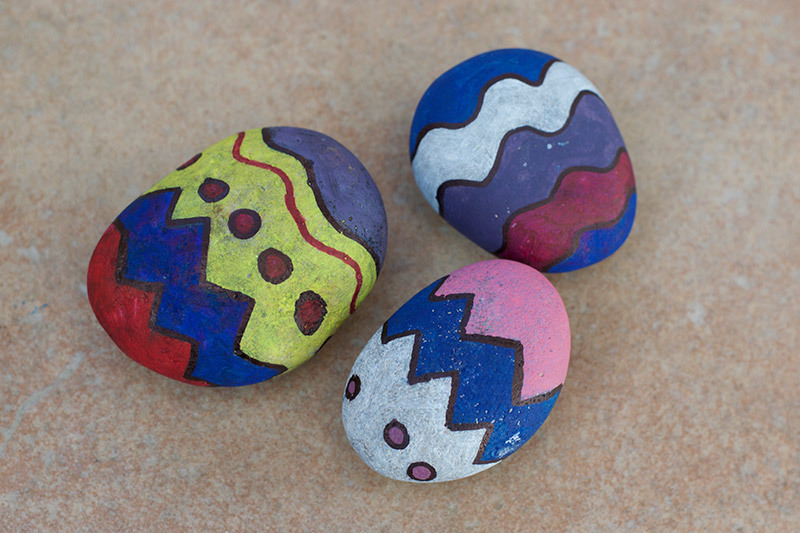 The great thing about rock painting is you can just go wild and use your imagination – anything goes! Plus any age can have a go. It can be as easy or as complex as you like. 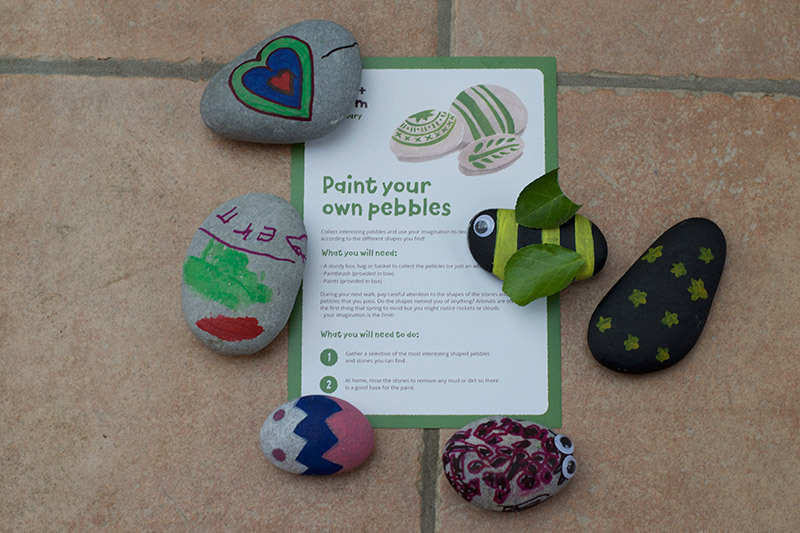 Our Mud & Bloom box contained a lovely set of acrylic paints and a brush to paint our pebbles with. 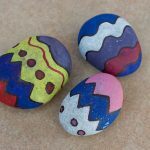 We all got stuck in and came up with an assortment of painted pebbles! 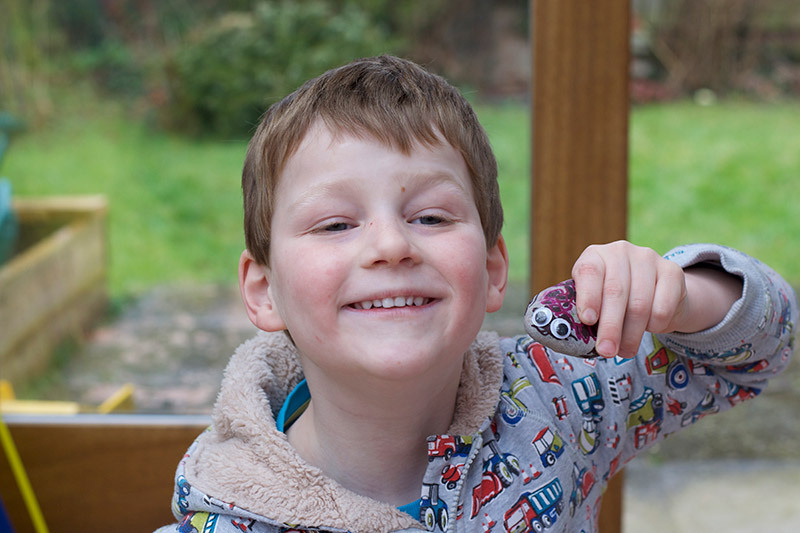 Little M also had the idea to stick some leaves and goggly eyes into some of his pebbles for further effect! 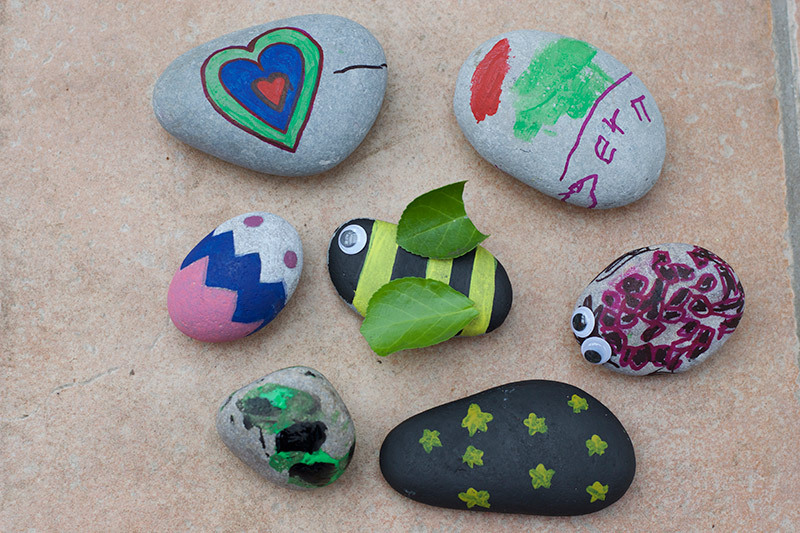 We are going to add some varnish to some of the pebbles to protect them from the elements. Then we are ready to go out and hide them! 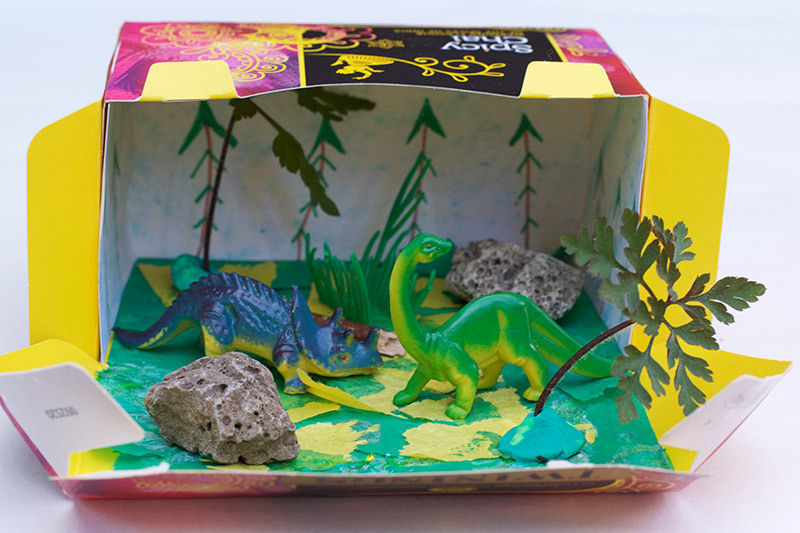 We loved our Mud & Bloom nature box and would recommend them to other families. 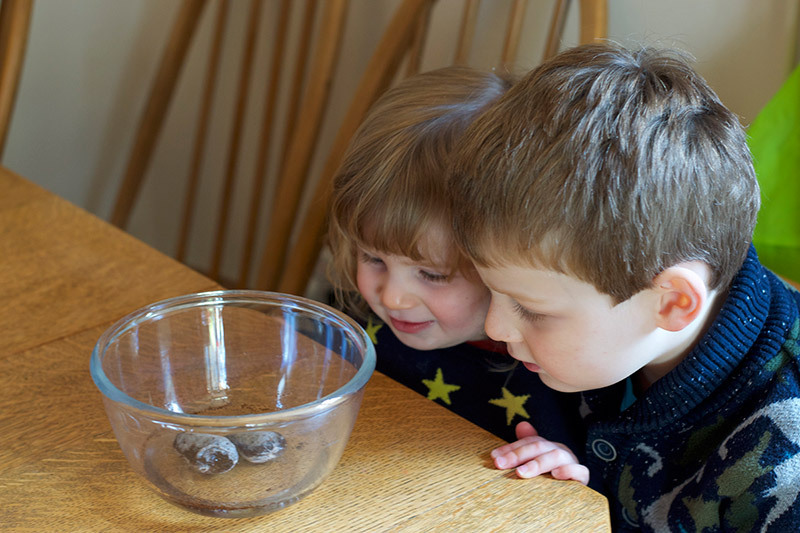 Mud & Bloom boxes make doing nature activities together simple and straight forward – all in a handy little box that comes through your letter box! 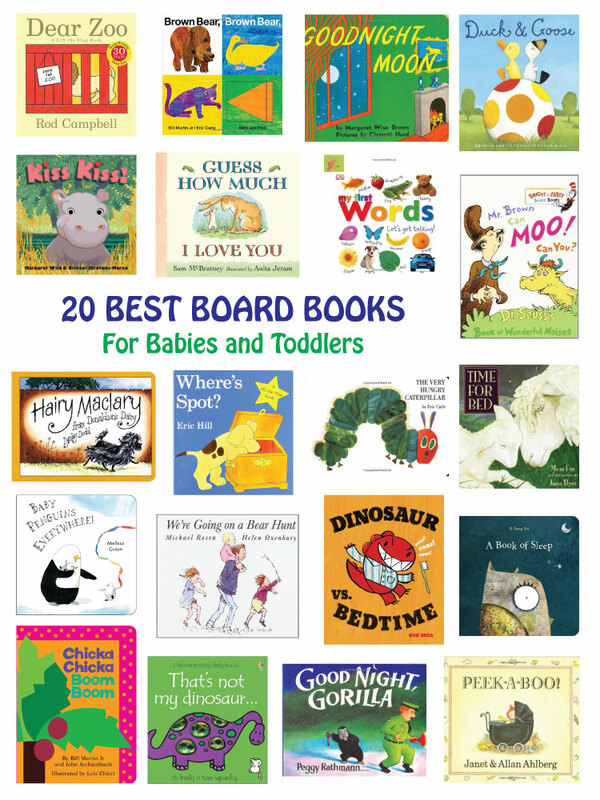 Mud & Bloom have kindly offered a huge discount for Little Fish readers. Use the code LITTLEFISH50 to get a a whopping 50% of your first box! For a limited time, so do head on over! 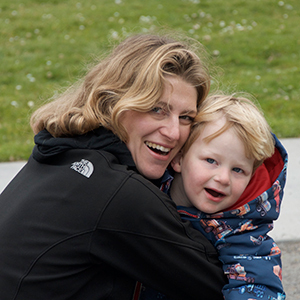 The boxes encouraged me to help my children connect with nature, in ways that I might not otherwise do. I learnt a lot myself too! Through our little planting activities, we have already found a new love of gardening! I’m excited to try out more nature activities and test out our nature observation skills on our next outdoor adventure! 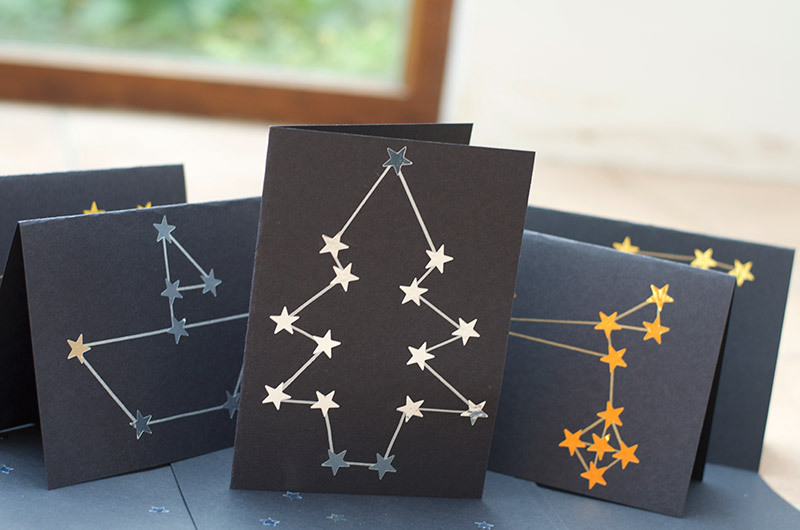 Find out more about the Mud & Bloom gardening and nature craft boxes and get your discount now! Will you give them a try? Disclosure: We have received Mud & Bloom boxes for the purposes of this review. All opinions are honest and our own. 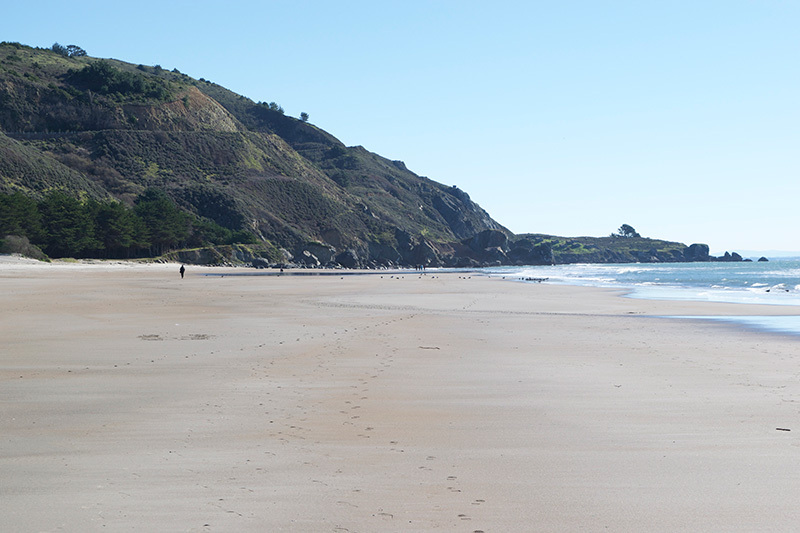 This looks like such a good idea and I really want to explore more with my little lady. 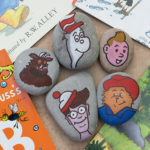 I want to do some of those rocks to take part in the Norfolk Rocks! Rosie, thank you for this post. Its very inspiring. This is absolutely fabulous! It has to be one of the best ideas for a subscription box I have ever seen. It has you written all over it! And us too for that matter! I love it! I also appreciated the picture of the little pebbles. While reading the comment the first thing that popped in my head was “What to they look like? How can I tell the difference between a lentil and a pebble? Will they look the same? Then low and behold you gave us a picture. You “have done this before! 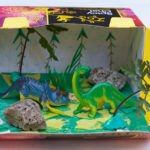 Oh this looks like a fab box for children, educational but also lots of fun!